Most dashboards/benchmarks/scorecards present data that is correlated. When two variables change together in some consistent way (e.g. training and improved performance), they appear to be related and are said to be correlated. Survey-based methodologies for evaluating investments can establish a correlation between the investment and the recipient’s performance. Many of you have heard the expression “correlation does not equal causation.” When two things appear to be related, it’s important to investigate whether other factors may be involved. To establish causation an investment’s impact on the business must be isolated from all the other variables that also maybe impacting the outcome. For example, there is a clear-cut relationship between ice cream consumption and murder rates—as more ice cream is consumed in the United States, more people are murdered. Is it fair to say that eating ice cream increases the likelihood that one’s life will be violently cut short? These events are clearly correlated, but digging further you will see high temperature is the cause. In hot weather, more people congregate outdoors, increasing the likelihood of conflicts leading to murders. These links are all correlations and thus do not say much about actual causes. To assert that ice cream sales have a causal effect is not only silly, it is irresponsible. 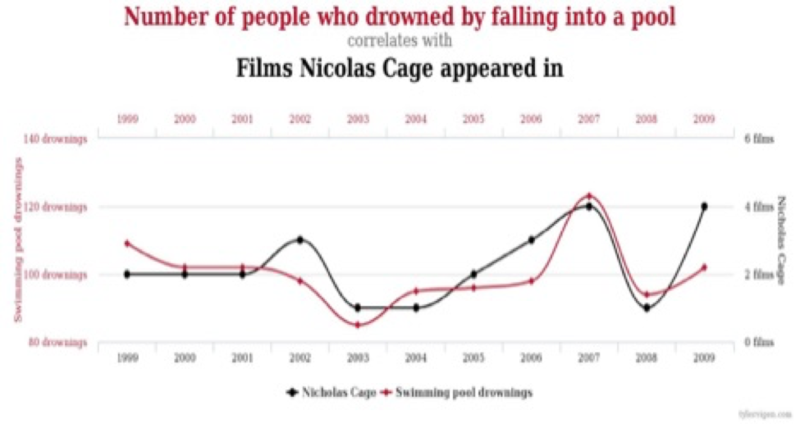 Tyler Vigen in his book Spurious Correlations has multiple correlated examples, such as the example above: The number of people who drowned by falling into a pool, and the films Nicolas Cage has appeared in. It makes no sense. In business, causality may be less obvious, leading even the wise man to misinterpret a strong correlation with causation. As we seek to establish causation, we are trying to identify the connection between an investment and a business effect, or determine which metric drives another. Ideally, we can identify the investments that positively impact our business metrics. Most analytical studies offer an approach that blends statistics with the best-articulated case the chain of evidence provides. In addition to a deep dive into as much data as can be accessed, we look for anecdotal evidence, success stories, and any other supporting evidence that tells the same story as the math and logic. Ultimately, proof is a combination of mathematics and old-fashioned reasoning.